begins with Coyote up to his old tricks as he steals fire from the Yellow Jacket Sisters. 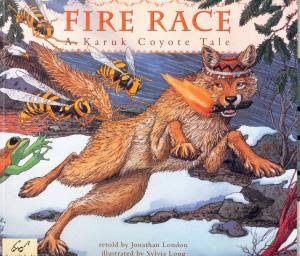 tells the traditional tale of how Coyote appealed to the vanity of the yellow jacket sisters to steal their fire. The race begins, with many local animals passing the fire to one another as the yellow jacket sisters chase them. Eventually, the fire is swallowed into the wood, where it is stored today for us to burn and stay warm. I just love this book! It has always been one of my favorites as a teacher and a parent. There are so many things to discuss, such as the vanity of the Yellow Jacket Sisters and the cooperative effort of the animals. I love to connect the story to our hearth for our children, as we give thanks for the warmth our woodstove provides us. It is a gift from the land.